Demolition Contractors - James G. Grant Co. Soon after James G. Grant Company Inc. was established in 1960, the firm launched its demolition division. 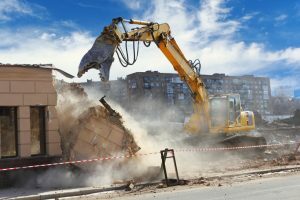 As demolition contractors, the company was a pioneer in local industry, providing demolition and dismantling services to large institutions as well as local Boston area developers and homeowners. James G. Grant continues to service those needs today. Demolition is one of those tasks that needs to be considered very carefully. That’s why, at James G. Grant our number one concern is ensuring that we meet our customers’ priorities and provide detailed specifications for every project. Demolition contractors James G. Grant Company has the knowledge and experience to safely handle any demolition job, large and small. We have the right people, the right equipment, and the right facility to deliver on our core value of serving the demolition needs of each and every customer, as our founder, James G. Grant, established many years ago. That’s why we’ve grown to be the niche leader of demolition services in the Boston region and beyond. As demolition contractors, we have the engineering expertise to recognize the risks and address all the safety concerns for each demolition project to fully protect people and property. We understand all the legalities involved in demolition and obtain the proper licenses and permits to do the work legally and properly. Call one of our skilled and knowledgeable demolition team members today to discuss any exterior or interior demolition needs you may have. You’ll appreciate the advantage you’ll find in hiring demolition contractors with unmatched experience, expertise, and skill.